The Fall time is the best period for gourmet to come to Italy. Many activities, medieval festival and truffle fairs are all around, especially in the North of this beautiful country. This is a fab reason to travel to Italy in the fall, properly a foodie’s dream. Mushrooms, chestnuts, truffles and chocolate are waiting for you! Here is some examples of events worth to try: for instance, a festival recreating the man in the iron mask, Maschera di Ferro, took place in the Piemonte town of Pinerolo the first weekend of October. The man in the mask is played by someone different each year. Sunday afternoon after the story is acted out, the mask is removed to reveal the man wearing it. Gorgeous are the fall festivals in Umbria, which include: La Festa del Bosco (Woodland fair) from 28 October up to the 1 November in Montone a beautiful truffle fair such as Mostra Mercato del Tartufo (Trade fair of Truffles) staging 14 /15 October in Pietralunga. 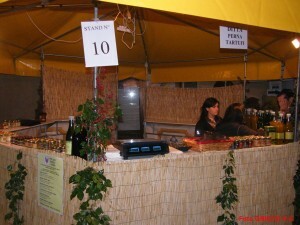 Or enjoy the Sagra della Castagna (Chestnut fair) on 21/22 October in Preggio (near Umbertide). Another Chestnut fair the same date is in Morra (near Citta’ di Castello) while a Trade fair of the truffle and woodland products is on at Monte Santa Maria Tiberina. Inside this festival category you can’t miss the Trade fair of the truffle and woodland products on early November at Citta’ di Castello’s (Citta di Castello). And fab is the Gubbio Chocolate Fair ,organised by Altrocioccolato at the end of October!!! alternative and with a focus on sustanability, it is really a nice experience, maybe after going in Perugia to check Eurochocolate, an event we already singled out in this blog. So if you are like my a food-addict, or better a fair-addict, just come around and have a look…not to mention the historical richness and beauty of each small town that hosts the single event! This entry was posted on Friday, October 14th, 2011 at 3:45 pm	and is filed under Events in Italy. You can follow any responses to this entry through the RSS 2.0 feed. You can leave a response, or trackback from your own site.